Achievement Day is the valuable opportunity in which we recognize and celebrate students’ effort, achievement and talent in their music study. Students can participate either as a solo player or as an ensemble group of 2 to 6 performers. 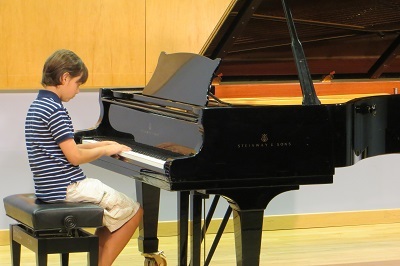 They will perform two solo pieces (one of them memorized, along with the scales in the key of each piece) (or two ensemble pieces for an ensemble group) and complete minimum two ~ maximum five music related activities called options. Upon completion, the students receive written comments on their solo (or ensemble) pieces and options from evaluators, a ribbon and a certificate for participation. The Super Achiever Medals are awarded to those who passed on solo (or ensemble) pieces, scored 80 or above in minimum one musical knowledge option (theory, terms & signs, history, ear training), passed on minimum one technique option (scales, chords, arpeggios), and passed on any two more options (total four options). To be eligible for the Super Achiever status, the students need to register as SA candidates.